One of the foundational aims of Borgmann’s whole book is the attempt to actually give an explanation for technology. Hence we discussed what counts as an explanation in the scientific realm in earlier chapters. In this middle section of the book, Borgmann is concerned to substantiate the notion of the Device Paradigm, not just as a feature of technology but as a way of explaining technology and everything that goes along with it. This chapter is therefore about “paradigmatic explanation”—we have this “device paradigm”, but what does it mean for this concept to be an explanation of technology? Borgmann begins by summarizing one type of explanation: “apodeictic” explanation, or the kind used in science. And of course, it is the physical sciences which in our society provide the standard for explanation. But science, Borgmann argues, fails to provide a theory, “in the sense of a steady and arresting view of our world” (69). Scientific laws may tell us what is possible, but they do not tell us what is relevant. There is, in other words, an overabundance of “givenness”, of things we could pay attention to or bring into focus or care about. Science itself does not and cannot set that vision for us. Scientific, apodeictic, subsumptive modes of explanation focus on the first column. But there must then be other kinds of explanation that focus on the second column or the whole picture. Borgmann therefore introduces the concept of “deictic” explanation, which answers the question “What is significant?” rather than the question “What is?” But is there yet a third possibility? Borgmann believes there is: paradigmatic explanation. Borgmann defines paradigmatic explanation as “explanation by elucidation of a predominant pattern”, and says that, compared to apodeictic and deictic modes, this would be considered “paradeictic” or “quasi-deictic”, since it does not shy away from looking at patterns that bleed into the second column above, patterns that are used as a guide to sort out the world. Combined with the concept of a paradigm, we are talking of using concrete examples of patterns to prove the existence of a larger, overriding pattern. So the Device Paradigm, as paradigmatic explanation, is designed to bring into relief the force that “more and more detaches us from the persons, things, and practices that used to engage and grace us in their own right” (76). From a historical perspective, this is the story of life being seen as toil, poverty, and suffering, and technology entering the scene as natural science promising to transform our experience and liberate us. The deep irony is then that disburdenment becomes disengagement. So what examples can we use as paradigms to bring to light the pattern above? Well, we have already considered many of them. A fireplace becomes a central heating system. A wagon becomes an automobile. A meal becomes a TV dinner. The pattern here is of Things (objects which have depth as a result of being part of the web of human significance) becoming Commodities (wherein the main benefit they provide is stripped from the thing itself and made available). 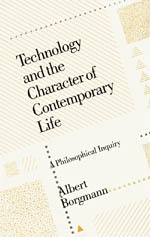 When we build up from these paradigm cases, Borgmann claims, and if we are at all concerned about the disengagement characteristic of modern life, then the Device Paradigm provides an extremely clear explanation for how technology serves as an “implicit guiding pattern for the transformation of this world”. This was a fun chapter to explore. I think that it was the first chapter that really started to unearth the fuller vision that is the device paradigm. I mean this as this was the first chapter that gave us the methods/techniques by which we can start to see this change. There was certainly a sense of movements or timelines in this chapter. For example: The DP serving as a guiding pattern; Patterns embodied in examples; Loss of engagement; Tracing development. If I bring this to OSS, I see a path as to how OSS is becoming domesticated or part of the background of work. What was once egalitarian is now business. What was once free is now labor. What was once creativity is now machinery.